Soon Indian-grown peanuts could replace tons of imported peanuts from Australia. ANANTAPUR: Groundnut scientists from the International Crops Research Institute for the Semi-Arid Tropics (ICRISAT) and partners across India have just developed the first-ever oleic-rich peanuts in Spanish and Virginia ‘bunch’ types, adapted to Indian farm conditions. Soon Indian-grown peanuts could replace tons of imported peanuts from Australia. The oleic-rich peanuts from Australia branded as ‘Heart Friendly’ with above 80 per cent of Oleic Acid more than indigenous varieties upto 45-50 per cent of oleic acid. Until now, Indian groundnut farmers have not benefited from the fast- growing global confectionary market, as they could not supply high oleic content peanuts required by the confectionary industry. Currently, Indian groundnut farmers grow ‘bunch’ type groundnut varieties adapted to rain-fed environments, early maturing and with rapid filling of the pods after flash rains. Such groundnuts are, however, low in oleic acid, around 45 to 50 per cent of total fatty acids. Certain groundnut varieties grown in America and in Australia are much richer in oleic acid (above 80 per cent) thanks to specific mutations in the gene coding the enzyme fatty acid desaturase or FAD,which blocks the conversion from oleic acid to linoleic acid. 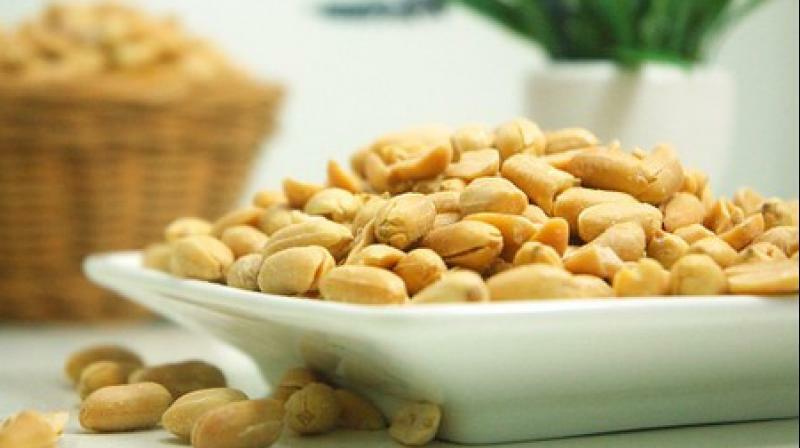 The food industry wants high oleic peanuts as they have tenfold lower oxidation compared to normal peanuts, improving their shelf-life from 2 to 9 months. There is no rancidity and high oleic peanuts have a much better flavour. Oleic acid or omega-9 fatty acid, which can be found in olives and nuts like almonds, also have important health benefits, a study revealed. At present, multinational confectionary companies are sourcing tons of high-oleic peanuts from Australia for their Asian processing units, in order to respond to the growing Asian market of peanut-based confectionary products like chocolate bars and breakfast cereals. However, there’s massive usage of peanuts locally in the form of food items by using groundnut oil, principal research scientist Dr Naik from Kadiri research station observed. Knowing the cost of importing peanuts and rising global groundnut prices, leading food companies are seeking opportunities to locally source high oleic peanuts from India and other countries in Asia and Africa where they operate. Such market pull for high oleic groundnut varieties would improve the incomes of many smallholder groundnut farmers. The strategic market-driven research is an ongoing collaboration between Icrisat and others.